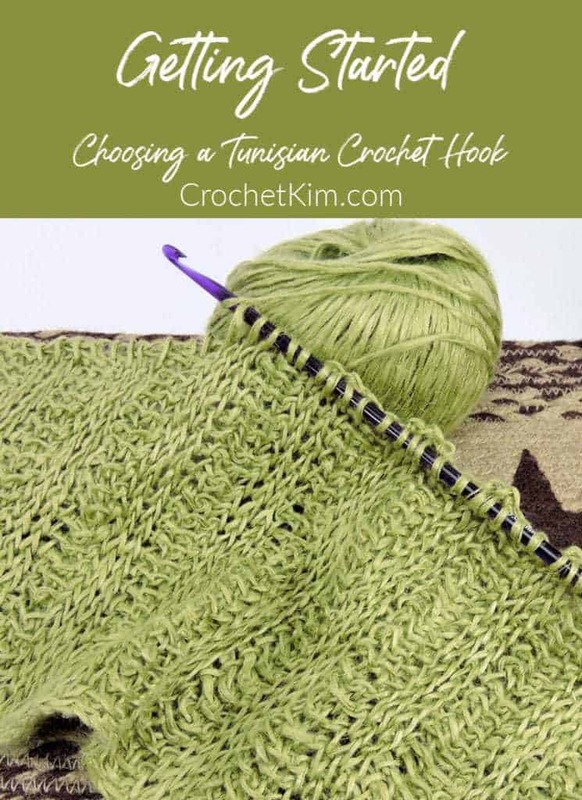 If you are new to Tunisian crochet, when choosing your hooks, keep in mind a few tips. 1) Your hook needs to be at least 1/3 as long as your project. For instance, you can make a 30″ project on a 10″ hook. However, some people prefer a cable to help distribute the weight of the work. 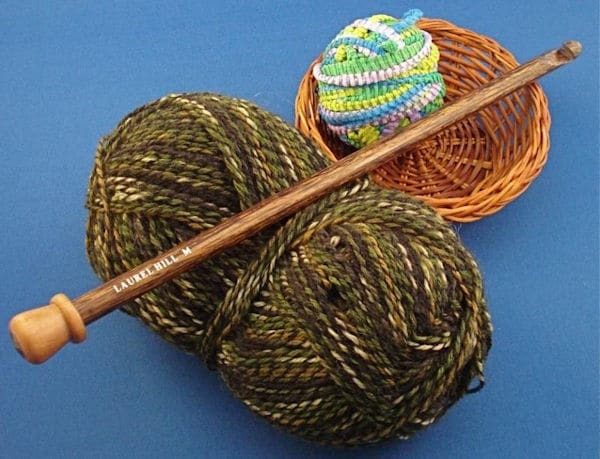 2) A double-ended hook can be used for regular Tunisian crochet. If your loops fall off the end, put a rubber band on the end to use as a stopper. 3) Double-ended hooks are a good bargain since you can use them for regular Tunisian, double-ended Tunisian and Tunisian in-the-round. 4) The choice of hook is a personal preference. There is no answer to “Which is the best?” Whether you like working with a cabled hook or a straight hook. Or, whether you like working with a metal hook or a bamboo hook. These are personal choices. 5) You do not need an entire set of Tunisian crochet hooks to get started. While it’s nice to have a range of sizes, it’s not necessary when you’re learning. You can even use a regular crochet hook to learn the stitches before you commit to purchasing extra hooks. 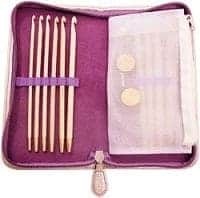 If you would like an inexpensive set to get started, there are several inexpensive generic bamboo sets available. These would get you started and you can always pick up a nicer set later. Keep in mind that the smaller size bamboo hooks can snap easily, but the larger sizes are used more anyway. 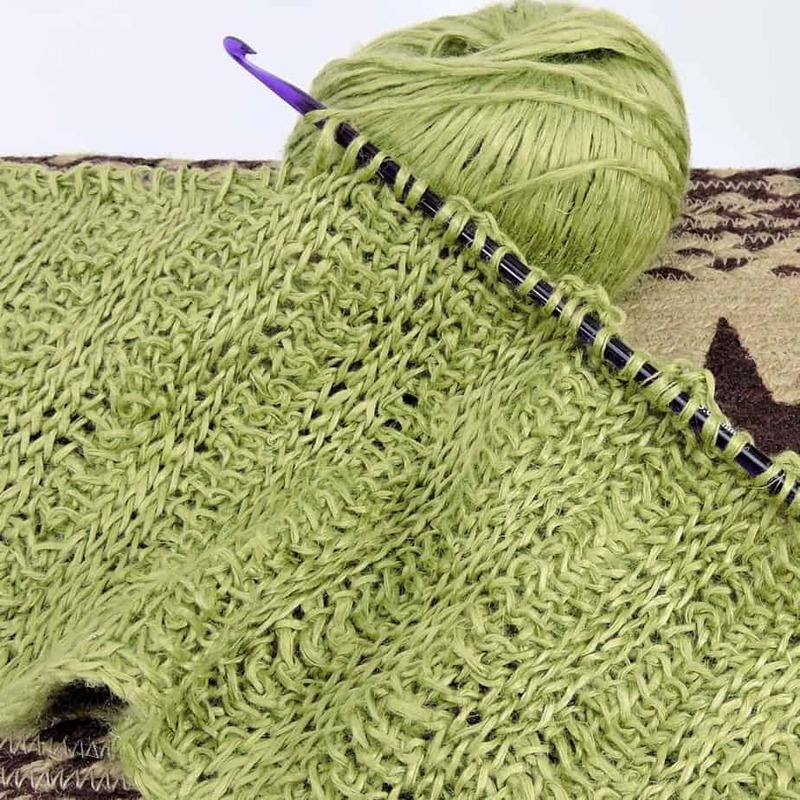 6) The usual “rule of thumb” on choosing a hook size is to use a size 2 or 3 sizes larger than the suggested crochet hook size of your yarn or, if there is no suggested crochet hook size, choose a hook 3 or 4 sizes larger than the suggested knitting needle size. The most frequent sizes I use are K and L with worsted/aran weight. NEW! ChiaoGoo now makes a fabulous interchangeable hook set with their SPIN feature! This is wonderful for anyone who experiences trying to keep the hook straight when the cable tries to force the hook in a different direction. See it at the ChiaoGoo website. 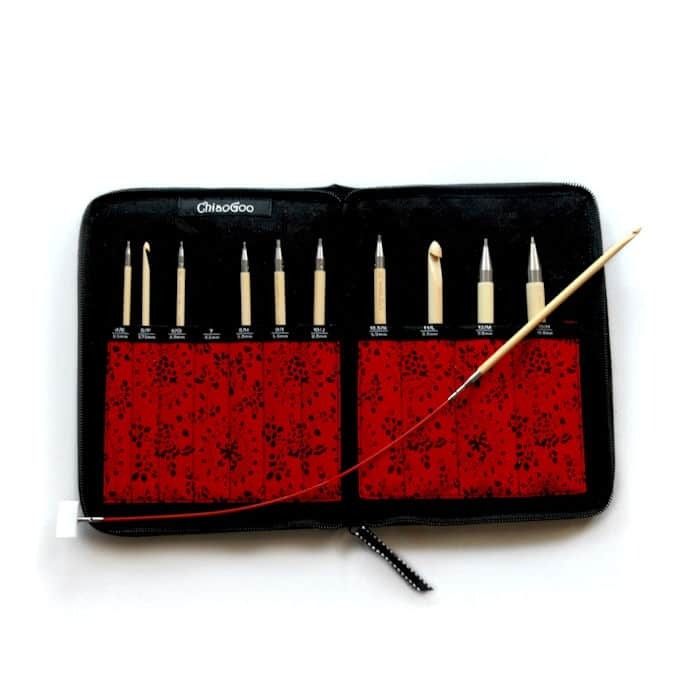 ChiaoGoo makes flexible and straight Tunisian crochet hooks. I believe I also have some double-ended cabled hooks from them. All made of bamboo. The flexible hooks are available in 24, 32, 40 and 60″ cord lengths and range in size from 4mm to 11.5mm. The straight hooks are 9″ or 13″ in length and range is size from 3.5mm to 11.5mm. Boye is obviously a well-known brand. 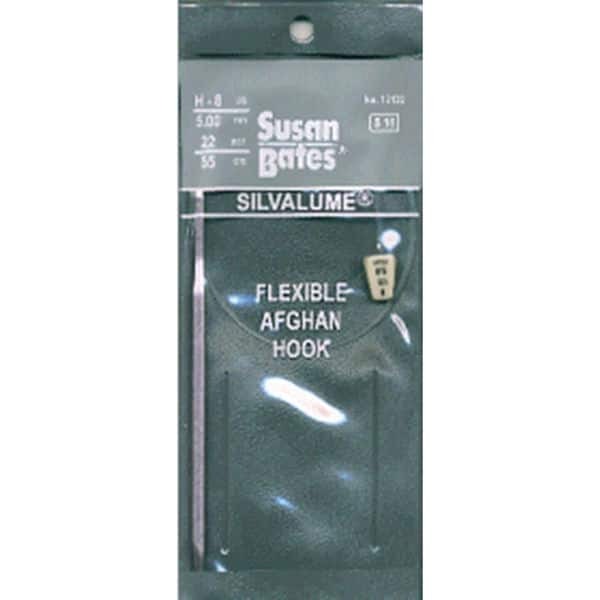 Straight Tunisian hooks are available in a 14″ length and are readily-available in sizes H, I and K. They also make double-ended 14″ hooks and have flex-cable hooks. Boye has a Rosewood collection which includes some super jumbo hooks like sizes R, S and T (14″ length). Susan Bates is also a popular and well-known brand. Hooks come in a 10″ length, making them lighter should you need something shorter. They are available in regular, double-ended and flex-cable. Laurel Hill makes Tunisian crochet hooks, 10″ in length, in sizes 3.25mm to 10mm. They are made of Forest Palm wood. Smooth, gorgeous hooks. 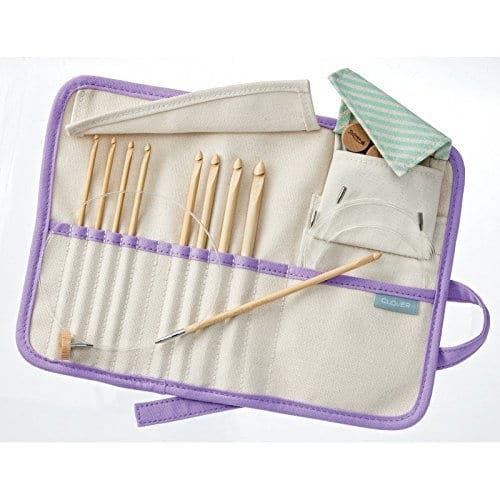 Clover makes this lovely interchangeable hook set with lightweight bamboo hooks in a handy case. Clover also makes some wonderful 6″ double-ended hooks, perfect for Tunisian crochet in-the-round. They are available in sizes 4mm through 6mm. Use care when choosing a double-ended hook from Clover. They also make double-ended hooks with a different size hook tip on each end. 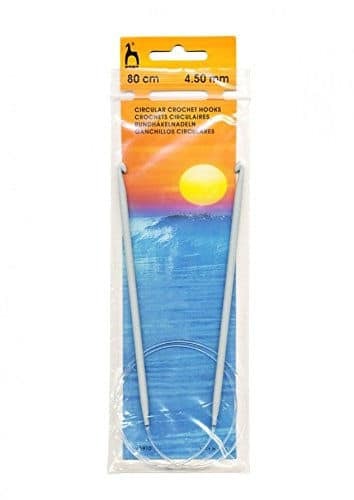 These are handy for regular crochet to reduce the number of hooks you carry around with you. Make sure that you are getting the double-ended hook made for afghan/Tunisian crochet. Turn of the Century hooks are available online in both double-ended and single-ended Tunisian crochet hooks (among a range of other supplies). The double-ended hooks are available in 3 lengths (10″, 12″, 14″), in sizes G-N. The single-ended are available in the same lengths, in sizes G-K. Although I don’t have one of these hooks myself, I have heard wonderful things about them. These are not mass-produced hooks. They are handmade by talented artisans. Denise carries interchangeable hooks. This will allow you to switch cables and hooks to suit your project. They are available in a set or separately. Yes, you can purchase the hooks separately which will allow you to try out the hooks before purchasing the set. Or, only purchase those hooks you use most. You can use the hooks for regular Tunisian, double-ended Tunisian and Tunisian in-the-round. The set includes: 12 individual hooks, sizes 3.75mm to 15mm, 7 cord lengths, four end buttons and two extenders. 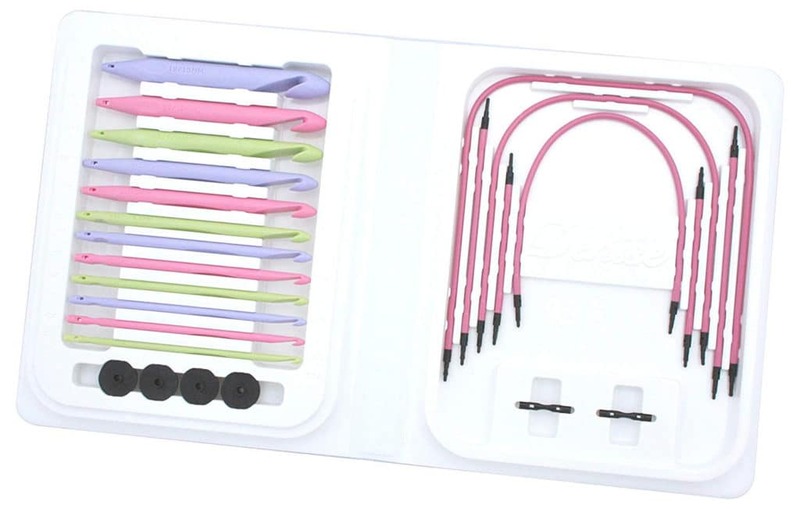 The set works with the Denise Interchangeable Knitting Needles, so you can interchange the cables, as needed. I use the Denise hook tips for regular crocheting at times as well. I especially find that the sharp point helps with slip stitch crocheting. 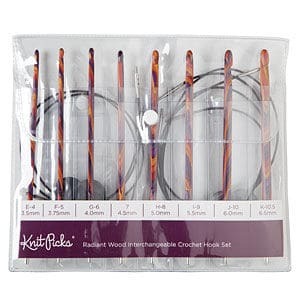 Radiant interchangeable hooks are available from Knit Picks. They work with the same interchangeable cables as their knitting needles. Hook tips and cables are available separately. Hook tips are available in sizes 3.5mm through 10mm. Tulip makes an interchangeable hook set in high quality bamboo. Hooks range in size from 3.5mm through 9mm. These hooks include the swivel cord. The swivel is very nice because it takes stress off your wrist. Pony makes double-ended and circular hooks. They are made of heavy-duty plastic casein. The double ended hooks are 13.5″ in length and are available in sizes 2mm through 6mm. The circular hooks are 31.5″ in length and are available in sizes 2mm through 6mm. Can be used for regular Tunisian and double-ended Tunisian.